The word on the street is my book is now available. Update: The original copy mistakenly had a draft of Chapter 9 included. If you had an early copy, please be sure to read the revised chapter online. 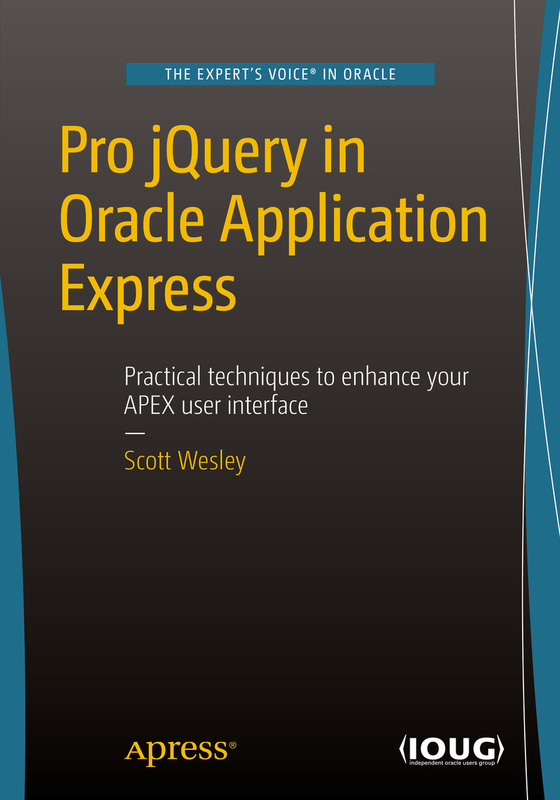 If you like using dynamic actions in APEX and want to learn how to use jQuery selectors effectively, this book is for you. If you want more flexibility with your dynamic actions, and understand how handy this.triggeringElement can be, give it a read. If you want some more ideas on how to improve the way your users interactive with your data, check it out. Practical techniques to enhance your APEX user interface, written for APEX 5.0. Complete acknowledgements in the book, but thank you to Alex Fatkulin for being the technical reviewer. Any mistakes you might find are on me, some chapters got some major revisions after Alex's eyes cast through them. In part thanks to the APEX 5.0 release, in part to me continuing to learn better ways to write jQuery. I missed the second X when referring to built in substitution string APP_AJAX_X01. I feel like I'm standing on the shoulders of some giants who have paved the way before me. Without the help of the broader community on the OTN forums, StackOverflow, Slack, Twitter, conferences and people sitting right next to me, such an accomplishment would not be possible. Three in particular have been vital in my learning of jQuery, thanks Tom Petrus, Jari Laine, and Jeff Eberhard. I've reviewed a bunch of books (and things) in the past, too, if you're looking for more book selections. I bought a few in the Cyber Monday sales, including the revised, multi-author gold nugget that is Expert Oracle APEX, plus a couple on node.js. I welcome you all to review mine on Amazon or your blog once you've had a read. Hit me on Twitter or Slack if you have any questions or commentary. I welcome your input. It was quite the experience writing this and I have all the hesitations I'm sure many before me have faced regarding it's reception. It was a rather lone project, but one undertaken with pride and enthusiasm. I'll write a few posts over the next few weeks that might whet your appetite for some jQuery action. And no, I wouldn't rule out writing another one day! Bevor I present my fussy comments :-) , let me say: Thank you for this book. I suspend reading it on chapter 17 to go back to the beginning, since I realized that it’s hard to recognize the below after a while – and even when reading it a second time. So for now this is what I found so far. 49 + 50 Under “Figure 5-6” The first two records are the same as on page 50 under “Option B …” I’m assuming this is not correct; however not sure. 104 “Sourcing …” Bases on this check. The… Bases on this check the callback… Seems the dot is wrong here and the two record should be (only) one. Thank you for this book. 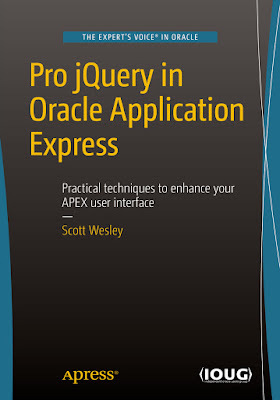 I'm sure this book will help developers to create rich and awesome apex applications. Thank you Scott - it's great idea! Thanks Andre. Have a read through this post regarding chapter 9 and the async parameter. Just received this book today and dive in ... Thank you for writing this book. I am so excited about this book. I got it for 1 week now and squeezed all possible time to read it and leveraged what I learned from this book to some apex applications I built for my company. Hi Kevin, thank you for your interest and kind words. You also sound like just the person I'd expect to gain from this book. If you only console.log(pData) you will get better breakdown of components. I find if you concatenate strings you get the far from useful [object Object] result. Unfortunately I won't be there in Chicago, but it sounds like it will be a cracking event.